Originally written for the Vol.6-No.2 edition (June 1, 2012) of the Toyama Hot News e-newsletter. “Nunobashi Kanjoe,” a ceremony performed in Tateyama, Toyama, has been registered in the 3rd “Heritage for the Future” list by the National Federation of UNESCO Associations in Japan, the first in Toyama Prefecture. Nunobashi Kanjoe began in the Edo Period, when women were not allowed into the sacred mountain of Tateyama. Nuno-bashi (Nuno Bridge) symbolized the boundary between this life and the afterlife. The women wore white robes and crossed the bridge blindfolded. After reciting prayers, they crossed back over the bridge. This ceremony was believed to be a path for salvation. The practice was discontinued in the early Meiji Period (1868-1912) due to the anti-Buddhism movement, but was recreated 136 years later, in 1996 at the National Cultural Festival. Thereafter, the ceremony was also performed in 2005, 2006, 2009, and 2011. 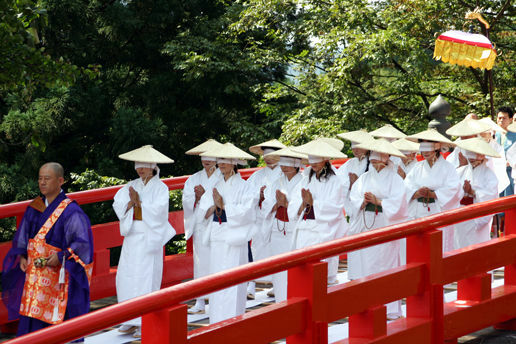 This past September, roughly three thousand spectators watched seventy participants from all over the country — mainly in their fifties and sixties – walked across the white cloth spread over the red bridge, accompanied by gagaku (traditional Japanese court music). At a joint event, the women’s group at Ashikura Temple provided local specialty foods such as rice cake and a stew of carrots, taro, and fried tofu. The “Heritage for the Future” program was started in 2009 to impart cultural and natural heritage for future generations, and ten projects are selected each year. Last year, there were 33 applications from 22 prefectures. Nunobashi Kanjoe was praised for its originality, and the way the entire region has worked together to pass on traditions. The next ceremony is scheduled for 2014. The Tateyama Museum is open all-year (except New Year’s holidays), and visitors can learn about Tateyama’s traditional religions, history, and nature. The main exhibit areas introduce the nature and religions of Tateyama, and feature a mandala, dioramas, and films. Then, visitors can experience “heaven” and “hell” in the themed areas.